Frank Herbert was born in Tacoma, Washington, and educated at the University of Washington, Seattle. He worked a wide variety of jobs--including TV cameraman, radio commentator, oyster diver, jungle survival instructor, lay analyst, creative writing teacher, reporter and editor of several West Coast newspapers--before becoming a full-time writer. He died in 1986. Berkley Medallion, 1988-01-20. Mass Market Paperback. Used:Good. 2003-09-05. New. Ships with Tracking Number! INTERNATIONAL WORLDWIDE Shipping available. Buy with confidence, excellent customer service! 2014-08-02. New. Ships with Tracking Number! INTERNATIONAL WORLDWIDE Shipping available. Buy with confidence, excellent customer service! 2012-03-03. New. Ships with Tracking Number! INTERNATIONAL WORLDWIDE Shipping available. Buy with confidence, excellent customer service! 1983-05-15. Good. Ships with Tracking Number! INTERNATIONAL WORLDWIDE Shipping available. May not contain Access Codes or Supplements. May be ex-library. Shipping & Handling by region. Buy with confidence, excellent customer service! 1970-06-01. Good. Ships with Tracking Number! INTERNATIONAL WORLDWIDE Shipping available. May not contain Access Codes or Supplements. May be ex-library. Shipping & Handling by region. Buy with confidence, excellent customer service! 2014-08-02. Good. Ships with Tracking Number! INTERNATIONAL WORLDWIDE Shipping available. May not contain Access Codes or Supplements. May be ex-library. Shipping & Handling by region. Buy with confidence, excellent customer service! 2012-03-03. Good. Ships with Tracking Number! INTERNATIONAL WORLDWIDE Shipping available. May not contain Access Codes or Supplements. May be ex-library. Shipping & Handling by region. Buy with confidence, excellent customer service! Berkley Medallion. MASS MARKET PAPERBACK. 0425090485 New Condition. . New. Berkley Medallion. MASS MARKET PAPERBACK. 042507465X New Condition. . New. WordFire Press. Paperback. 1614750459 Please allow 4 - 14 business days for Standard shipping, within the US. Thank you for supporting our small, family-owned business! . New. 2012-10-16. Reprint. WordFire Press. Paperback. 1614750459 Please allow 4 - 14 business days for Standard shipping, within the US. Thank you for supporting our small, family-owned business! . Fine. 2012-10-16. Reprint. WordFire Press. Paperback. 1614750459 Please allow 4 - 14 business days for Standard shipping, within the US. Thank you for supporting our small, family-owned business! . Fair. 2012-10-16. Reprint. 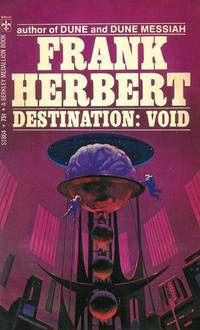 Destination: Void, A completely revised author's edition of the classic deep-space adventure! Berkley. MASS MARKET PAPERBACK. B00435VB60 FREE Shipping (First Class/Media Rate)! NEW! Beautiful, unread copy! I can send expedited rate if you chose; otherwise it will promptly be sent via media rate. Have any questions? Email me; I'm happy to help! We recommend priority shipping for just $3.99 to get your book ASAP. . New. Berkley Medallion. MASS MARKET PAPERBACK. 042507465X Like New Condition. . Fine. Berkley Medallion. MASS MARKET PAPERBACK. 0425090485 Like New Condition. . Fine. Berkley. Used - Good. Ships from Reno, NV. Shows some signs of wear, and may have some markings on the inside. 100% Money Back Guarantee. Shipped to over one million happy customers. Your purchase benefits world literacy! Berkley. Used - Good. Shows some signs of wear, and may have some markings on the inside. WordFire Press LLC. Hardcover. 1614755337 Special order direct from the distributor . New. Berkley. Used - Good. Ships from the UK. Shows some signs of wear, and may have some markings on the inside. 100% Money Back Guarantee. Your purchase also supports literacy charities. WordFire Press LLC, 2012. Paperback. Very Good. Disclaimer:A copy that has been read, but remains in excellent condition. Pages are intact and are not marred by notes or highlighting, but may contain a neat previous owner name. The spine remains undamaged. At ThriftBooks, our motto is: Read More, Spend Less.Minor shelf and handling wear, overall a clean solid copy with minimal signs of use. VINTAGE FIRT PAPERBACKE DITION 1966 Secure packaging for safe delivery.Dust jacket quality is not guaranteed. WordFire Press LLC. Hardcover. 1614755337 BRAND NEW! NOT DIRTY OVERSTOCKS OR MARKED UP REMAINDERS! . New. WordFire Press, 2012-10-16. Paperback. Used:Good. WordFire Press. PAPERBACK. 1614750459 Special order direct from the distributor . New. New York: Berkley Medallion, 1970. A solid copy of this fine novel, originally published as 'Do I Sleep or Wake' in Galaxy, 1965. Interiors are tightly bound and lightly tanned. Soft cover wraps show mild shelfwear. Spine is uncreased, just lightly chipped. A solid copy and a fine read.. 3rd Paperback Printing. Mass Market Paperback. Very Good/No Jacket. 12mo - over 6¾" - 7¾" tall. Berkley F1249, 1966. Berkley F1259 first printing June 1966 in Very Good Plus condition. Cover art by Hoot. A Paperback Original.. Mass Market Paperback. Very Good Plus. WordFire Press. PAPERBACK. 1614750459 Brand New! No Remainder Marks or Worn Dirty Overstocks! . New. Penguin Publishing Group, 1978. First Edition THUS. Mass Market Paperback. Very Good. Disclaimer:A copy that has been read, but remains in excellent condition. Pages are intact and are not marred by notes or highlighting, but may contain a neat previous owner name. The spine remains undamaged. At ThriftBooks, our motto is: Read More, Spend Less.First edition THUS, first printing. Minor shelf and handling wear, overall a clean solid copy with minimal signs of use. Secure packaging for safe delivery.Dust jacket quality is not guaranteed. Berkley Medallion, 1966-06. Mass Market Paperback. Good. Penguin. Paperback. GOOD. Spine creases, wear to binding and pages from reading. May contain limited notes, underlining or highlighting that does affect the text. Possible ex library copy, thatâll have the markings and stickers associated from the library. Accessories such as CD, codes, toys, may not be included. Berkley Medallion, 1984-07-01. Mass Market Paperback. Good. New York: Berkley Publishing Corporation, 1971. A solid copy with previous owner's info to the first page. Light wear to the covers and moderate creasing to the spine. A solid copy of this classic.. 4th Paperback Printing. Mass Market Paperback. Good/No Jacket. 12mo - over 6¾" - 7¾" tall. Penguin Publishing Group, 1983. Mass Market Paperback. Good. Disclaimer:A copy that has been read, but remains in clean condition. All pages are intact, and the cover is intact. The spine may show signs of wear. Pages can include limited notes and highlighting, and the copy can include previous owner inscriptions. At ThriftBooks, our motto is: Read More, Spend Less.Dust jacket quality is not guaranteed. Penguin Publishing Group, 1983. Mass Market Paperback. Acceptable. Disclaimer:A readable copy. All pages are intact, and the cover is intact. Pages can include considerable notes-in pen or highlighter-but the notes cannot obscure the text. At ThriftBooks, our motto is: Read More, Spend Less.Dust jacket quality is not guaranteed. Berkley Publishing Corporation. Used - Good. Good condition. Slightly dampstained. Berkley Medallion. Used - Very Good. Great condition for a used book! Minimal wear. Berkley Medallion. Used - Good. Shows some signs of wear, and may have some markings on the inside. Berkley. Used - Good. Ships from Reno, NV. Former Library book. Shows some signs of wear, and may have some markings on the inside. 100% Money Back Guarantee. Shipped to over one million happy customers. Your purchase benefits world literacy! Berkley. Used - Good. Good condition. Owner's name on endpage. Berkley. Mass Market Paperback. 0425062635 . Very Good. 1983-05-01. Berkley Medallion. Mass Market Paperback. 0425090485 . Very Good. 1986-04-01. Seventh Printing. Ace Books. PAPERBACK. B000RKPAUI Very Good Condition. Has some wear. Five star seller - Buy with confidence! . Very Good. Penguin Publishing Group, 1987. Mass Market Paperback. Acceptable. Disclaimer:A readable copy. All pages are intact, and the cover is intact. Pages can include considerable notes-in pen or highlighter-but the notes cannot obscure the text. Berkley Medallion. Used - Good. Ships from the UK. Former Library book. Shows some signs of wear, and may have some markings on the inside. 100% Money Back Guarantee. Your purchase also supports literacy charities. Penguin Publishing Group, 1986. Mass Market Paperback. Acceptable. Disclaimer:A readable copy. All pages are intact, and the cover is intact. Pages can include considerable notes-in pen or highlighter-but the notes cannot obscure the text. At ThriftBooks, our motto is: Read More, Spend Less.Dust jacket quality is not guaranteed. Penguin. Used - Good. Ships from the UK. Shows some signs of wear, and may have some markings on the inside. 100% Money Back Guarantee. Your purchase also supports literacy charities. Penguin Publishing Group, 1981. Mass Market Paperback. Acceptable. Disclaimer:A readable copy. All pages are intact, and the cover is intact. Pages can include considerable notes-in pen or highlighter-but the notes cannot obscure the text.